Somewhere in the first third Spike Jonze’s Adaptation, New Yorker writer Susan Orlean (Meryl Streep) scribbles “delusions of grandeur” into her notebook as she sits smiling and listening to the ramblings of obsessed orchid wrangler John Laroche (Chris Cooper). As much as she’s attracted to his energy and his apparent devotion to his “art”, she can’t help but be embarrassed by his overreaching aspirations. 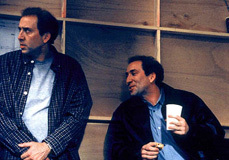 That those feelings of admiration, which never evolve beyond the tenuous and essentially sum up my personal feelings toward Adaptation, are included in the film, is typical of the movie’s self-aware schematics, which do everything they can to disarm criticism in hopes that the audience will give up and accept its onanism. Adaptation is clearly an intelligent film, but it’s intelligent in the worst way. It uses its smarts to build defenses instead of attempting to push closer toward genuine emotion. Screenwriter Charlie Kaufman integrates himself into the film as its main character, playing a screenwriter who’s attempting to pen a film based on Orlean’s “The Orchid Thief” and creating endlessly self-reflexive situations that never add up to as much as one might hope. The film begs the audience to be bowled over by the audacity of its narrative stunts, which change the script from a direct translation of the novel’s themes into a meditation on the process of adaptation itself, but the grace that the script strives for when bringing its three narrative threads together is never achieved. This failure becomes most obvious in retrospect, when the realization dawns that the most affecting, inventive, and honest moments of the film were those that hewed most closely to the original text. Even before the film begins indulging itself in clichés, the observations that it makes about Kaufman’s struggle in his writing process seem as if they have been culled from an amalgamation of every neurotic writer ever to grace the screen. Adaptation’s gambits might be more tolerable if they were at least self-deprecating in original ways, but it chooses shopworn targets for attack time and again (he uses a typewriter, he’s socially awkward, etc…). For example, its criticisms of Hollywood’s artless, commerce-driven mindset seem paradoxical because this film’s own existence proves the risk-taking still occurs in Hollywood (even if this risk doesn’t exactly pay off). A cynic could even argue that this is a perfect example of how Hollywood can approximate everything pop culture can throw at it, including a chic anti-Hollywood attitude. In any case, the attacks become especially dubious one when considers a film like A.I. : Artificial Intelligence. Even as though that film’s script had its problems too, guessing whether its inventions sprung from the head of Kubrick or Spielberg was far more fun and stimulating than anything that Kaufman has to say about the writing process. - True to the spirit of the film, I’ve tapped out my notes about the film and included them so you can see my process… Isn’t this so wildly fun!?!? I feel so free! Can it really be about its own creation (of course not) or is it about the self-flattery? Screenwriter envisions film directly? No director? / middleman? Neurotic rambles are the worst part = honesty is thought through as conceit too so it’s not really honesty at all, so it’s not satisfying. and endlessly amused that there is a deliberately awful looking Nic Cage in the part of not only Charlie Kaufman , but also as an invented twin brother named Donald.